Each year, the Coulter Investment Forum showcases between 25 and 30 start-up companies with life science innovations de-risked using the Coulter Commercialization Process. 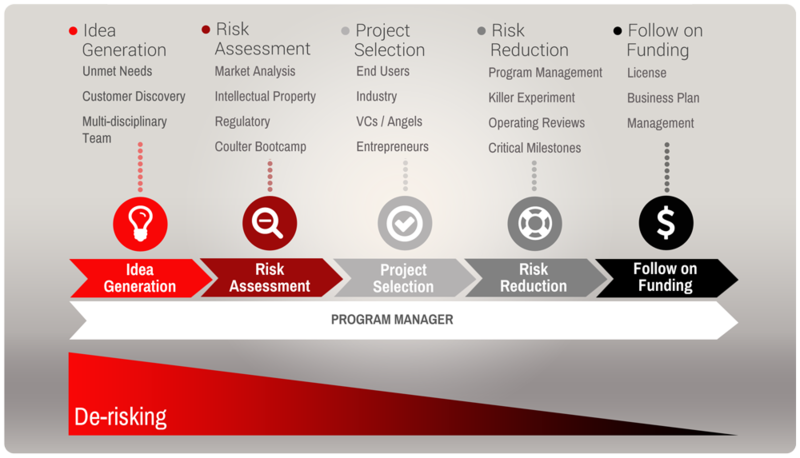 The Coulter Commercialization Process is a documented 27 step process utilizing industry best practices. Its goal is to accelerate academic innovations to the market to improve patient care by reducing risk and attracting follow-on-funding. To be considered for participation, each company must have a CEO, a solution to a large unmet clinical need that is capable of changing medical practice, and an addressable market large enough to attract an industry partner, venture capital, and/or angel investment. The presenting companies are submitted by the 16 Coulter Translational Partner Universities. Learn more about the  Coulter Investment Forum  and view the company presentations.